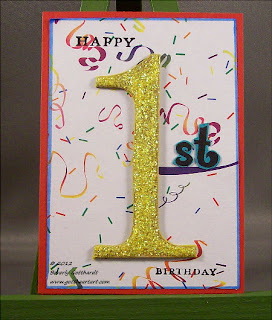 We're wishing Wicked Wednesday ATC Challenge Blog a very, very Happy Birthday and 1 Year Anniversary. Jenn the owner of the blog has put together a very talented team and has brought us some very fun challenges over this last year. I hope you will take the time to click over and see the plethora of wonderful ATCs the team has created. Ididn't take the time to count all the sponsors for this challenge, but there are a bunch so that's means lots of prizes for those of us who enter. I can't remember which challenge I came in on, but I have really enjoyed playing at Wicked Wednesday and getting to know this wonderful team. I used some happy yellow stickles on the #1, stamped and cut out the st. It's so cool when you cut a piece of paper and then when you begin to lay out your elements to attach you see some neat opportunities. Just a little on here, but once I laid the #1 on the ATC I saw that the st would sit just right on the purple confetti that was on the background paper. So with this red ATC blank, the confetti pattern paper with blue paint pen border, the happy yellow #1 with the cute st, and the tiny stamped Happy Birthday I'm wishing all of you at Wicked Wednesday ATC Challenge Blog a Happy Birthday and Anniversary and continued success in the coming years! You provide us with a wonderful place to play. A perfect 1st Birthday ATC for our Wciked Wednesday 1 year celebration - thanks for being so supportive Bev!!! It's true...I'm running behind schedule but still wanted to stop by and say that this is just adorable and a wonderful way to celebrate WW's first anniversary! Thanks for playing along with us and joining the party! Congrats on winning and I hope you enjoy your new image from The Doodle Garden.